Ottieni una panoramica completa della storica Porvoo durante questo tour di 4 ore da Helsinki. Esplora la città, un vivace porto mercantile nel corso del 14 ° secolo, sede di colorate case di legno lungo i corsi d'acqua. Ritiro e riconsegna dell'hotel a Helsinki inclusi. Inizia la tua esplorazione di mezza giornata di Porvoo con pick-up senza problemi presso il tuo hotel a Helsinki. In un comodo veicolo turistico, percorri circa 45 minuti per Porvoo, dove incontrerai la tua guida per il tour di veglia. Passeggia lungo i corsi d'acqua per vedere le case in legno dai colori vivaci. Molti di questi edifici sono sotto stato protetto, e alcuni sono ancora abitati dai discendenti delle famiglie che hanno fondato la città nel 14 ° secolo. Visita la cattedrale di Porvoo e visita alcune delle boutique e dei ristoranti più affascinanti della città. Entra nella cioccolateria locale per assaggiare un pezzo o due del famoso cioccolato locale Porvoo. La tua guida è felice di fornire altri suggerimenti su cosa vedere e fare nel tempo libero. Alla fine del tuo tour di 4 ore, torna a Helsinki per il rientro al tuo alloggio. Good half day tour from Helsinki. Pickup and return were seamless. 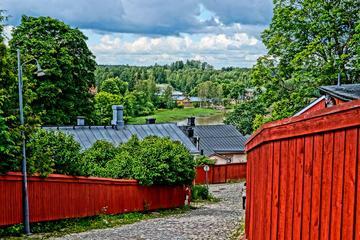 Our guide was really good and give us an overview of the history of Finland as well as Porvoo. An interesting old town with many buildings now converted to shops and cafe's. The Church was a particular highlight. You have about two and a half hours in the town - including about an hour on the guided tour - which was just about right for us. Our tour guide was professional, very courteous with very detailed information about Porvoo. We enjoyed our time at Porvoo with her during the walking tour. The logistics of this trip is you are transferred by vehicle from Helsinki to Porvoo, where you meet your tour guide. Tour length a bit misleading, as it includes the transfer to/from Helsinki, which is ok, with only about 90 minutes at most at Porvoo, so no time for shopping, eating or quick recap of the highlights of the tour. But, as a snapshot of the town it is ok. This tour was wonderful, just the right pace, great beauty and history and never felt crowded or rushed. This tour was done through the local company of Carisa Travel Group Oy, and our contact was Özgur. He was amazing. There was an issue with the car that was going to pick us up, so he quickly arranged a private car the entire time checking in with us by phone to keep us posted we never had to wonder for one second what the plan was. The private van through Kajon Taksi arrived when Özgur said it would, and the driver came into the hotel to get us. He is Ari and an absolute delight, amazing conversationalist, and extremely helpful. Because of the slight glitch with the first car, even though immediately remedied, Carisa Travel Group, through Özgur made sure we had our own private guide waiting for us in Porvoo. She is Ritva Karmi, and absolutely the most informative, sweetest, and caring guide you could ask for. She made sure of what we wanted to do, totally respectful of our needs, and so passionate about this beautiful town where she lives. Thank you all, Viator for choosing the best local companies, Özgur from Carisa Travel Group for being incredibly communicative and accommodating, Ari for making the drive to and from Porvoo awesome and Ritva for her passion about this beautiful place. a long trip for a samll, old town. Not really worth the time going to and from. But at least we have done it and now we move on.